This incalmo bowl features an incredible 21 separate sections that come together to form an absolutely unique and stunning bowl. Each section was formed as its own separate molten bubble, then they were fused together and blown out as one unified bubble using the incalmo method. Make sure to zoom in to see how neat it looks with so many unique bands of glass. 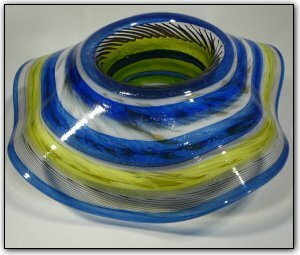 The incalmo technique is one of the most difficult techniques in glassblowing, and in order to create this bowl that process had to be repeated 21 times!